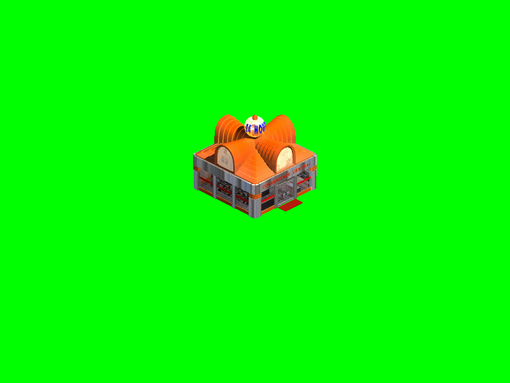 Starting from version 2.700, Capitalism Lab supports user modifications of specific buildings. 1) Find the building you want to modify in the “Buildings (Original)” folder, and copy the building subfolder to the “Buildings” folder. For example, you want to modify the building image of Convenience Store, you can copy the subfolder “CONVENIE” from the “Buildings (Original)” folder to the “Buildings” folder. The copied folder will be located at MOD_Kit\Images\Buildings\CONVENIE. If you cannot figure which file to copy, you can look up the file name of the building you want to modify from the Excel file “Building filenames lookup.xls” in the “Buildings (Original)” folder. The file must be in PNG format. The background color must be pure green color (RBG values should be 0, 0, 255). The building must be centered on the PNG image. If the building is animated, the image files of the animation must be in alphabetic order. If the building is animated, the number of individual image files in each of the “L’, “M” and “S” folders must be the same. If the building is not animated, there should be only a single file in each of the “L’, “M” and “S” folders. 3) When you have finished modifying the building images, edit PACK.BAT using a text editor like Notepad and change the output file name. 4) Now run the modified PACK.BAT file to compile the PNG files into a sprite file with .SPR file extension. 5) Go back to the building group folder Mod_Kit\Images\Buildings and run PACK.BAT to build BUILDING.RES which will comprise of all customized building files. 6) Go to the Mod_kit’s root folder and run PACK.BAT to build a new MOD resource file. 1) When you have modified the building image file, you may want to update the building’s icon file as well. 2) Go to the folder Mod_Kit\Images\Buildings_Icons and run PACK.BAT to build BUILDING_ICONS.RES. 3) Go to the Mod_kit’s root folder and run PACK.BAT to build a new MOD resource file. You can find sample image files for the Automobile Outlet building that come with the MOD kit at the Buildings folder and Building_Icons folder respectively.